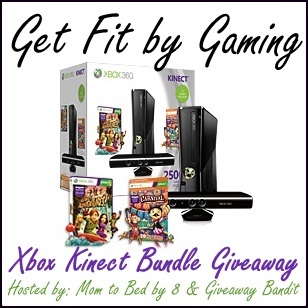 Who wants to win an xBox 360 Bundle with Kinect? The xBox 360 with Kinect is my favorite gaming console. We aren’t big gamers but we do enjoy playing every once in a while. Plus, the Kinect is very good exercise! Good luck everyone! Probably would download Bingo Bash. well I would get a twitter ap first, how else would I tweet contests? I’d play Carnival games with my family. I would like to find a yoga game so I can work out while playing! The new Disney Infinity game that’s coming out in June. Zumba! And Skype! Don’t really know the games but have heard about them! I’d buy one of the latest baseball games and play that. I’d play Call of Duty. I would play Call of Duty with my husband! Would look for something that uses the Kinect feature possibly Tai Chi. I guess I would play the Carnival Games that come with this bundle?? But I would definitely look into some gentle exercise “games” that I could do! We would play the carnival games. One of the Dancing games. I would try out carnival games. I might get the newest HALO. That’s a toughie. Would try Tai Chi I think. I’d play Carnival Games: Monkey See Monkey Do first! The Carnival game looks pretty fun! I don’t know which one I would buy first, though. I’d let my grandkids pick the game. I would play Dance Central first! We’d probably play something from Hasbro’s Family Game Night. I like those kinds of games. Carnival Games look like fun, we’ll play that first. I would play aliens colonial marines first. Probably Dance game or Zumba! I would play Call of Duty. i would play one of the starwars games..my son and i played at the electronics store and had a blast. it was quite a workout! I would play You Don’t Know Jack. Used to play it on my computer back in the day but now it’s an Xbox game. Love it!! Play games with my family! we would play just dance first, we have been wanting an xbox for so long!!! My first game would be Halo 4. Thank you for the terrific giveaway! I’d dl and play some XBox Minecraft! I would like to get bowling and play that. Anything that reminds me of Super Mario 3!!! I would probably play the Carnival game first. Thanks for the contest. Halo…any version! 🙂 Thank you.